If you're lucky enough to be connected to a fibre-optic broadband network at work or at home, you'll need both a solid cable modem and router to squeeze maximum bandwidth out of the line and then beam it to different parts of the property. Netgear is looking to provide an alternative to standard ISP-supplied kit with its new flagship AC1750 modem router, which combines modem speeds of up to 680Mbps with Gigabit WiFi speeds of up to 1750Mbps (using the 802.11ac Wi-Fi protocol). It's been launched at the CES 2014 trade expo in Las Vegas alongside an entry-level cable modem, the Netgear N450 Wi-Fi, which provides up to 340Mbps cable modem speeds and up to 450Mbps on the 2.4GHz Wi-Fi band. 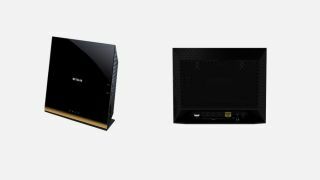 If you're not keen on parting with your existing modem router - or if you live in a barn, mansion, or submarine-shaped house (you never know...) - you might also be interested in Netgear's two new Wi-Fi range extenders - also unveiled in Las Vegas. Range extenders help carry your router's Wi-Fi signal further, transmitting it to other areas of the property when plugged into any wall power socket that shares the same electrical wiring as the one that the router's connected to. The AC750 Wi-Fi Range Extender uses 802.11ac Wi-Fi to extend a router's Wi-Fi signal, providing speeds of up to 750Mbps. Levels of coverage are indicated on the front of the device using a row of LED indicator lights to help with placement. It's joined by the beefier AC1200 High Power W-Fi Range Extender, which also uses the 802.11ac standard and provides up to 1200Mbps using 700mW high power amplifiers, high gain 5dBi external antennas and a dual-core processor. We've contacted Netgear for pricing and availability on the AC1750, N450, AC750 and AC1200 and will provide an update as and when.